There were lots of ideas in my mind for today's prompt. I could show a change of seasons with a collage of various pictures taken from my balcony... foggy, cloudy, clear sky, monsoon. Or I could show the change in me... from when my hair was really long to when it was practically in a boy cut. I could show the change in my nephew Yuvraj... from the day he was born to the day I last saw him in Patna. Or I could show the change in a cooking process... from the ingredients to the finished dish. I could photograph an old chip of soap placed next to a brand new bar of soap. Or I could simply take a picture of my wall clock, to show the changing time. Buds and flowers from the gardens downstairs, or a nest full of pigeons and their eggs/baby pigeons. I could even photograph the recent alteration marks in some of my tops, to show my expanding waistline! A best-out-of-waste art-work that I did a couple of months ago. Some old wool and an empty chilli sauce bottle... recycled into a pretty vase with some handmade flowers. Here's how I did it, in case anyone wants to know... 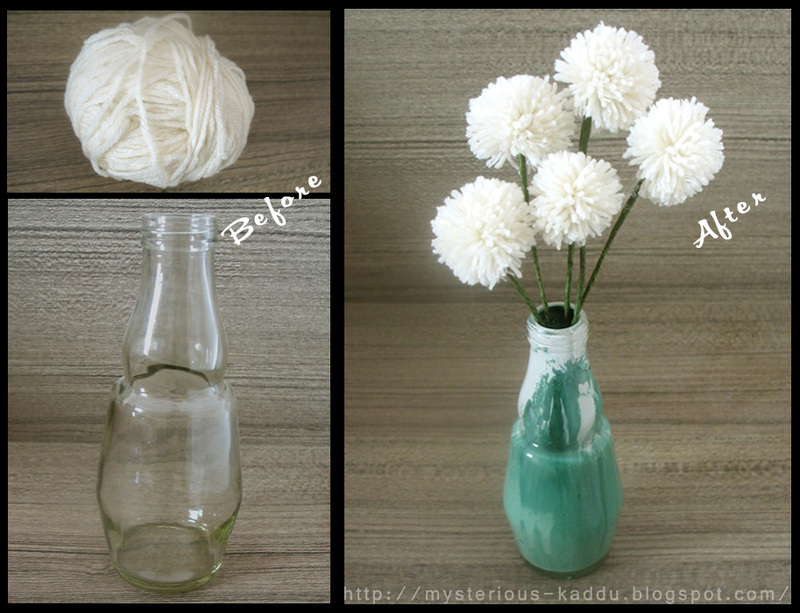 Snowy Alpines: Recycled Jars with Wool Pom-Pom Flowers. This is my 22nd post for 2013 May Photo A Day Challenge. Link to the previous post: "Photo A Day - I Care About This..."
we at home made wool table cloths and fridge covers ! For a change, this is an innovative post of the day. The colors are so very refreshing here!!! And it looks so beautiful! Afshan - Knitting is one thing that I didn't learn... even though my mom was a pro at it! But, I totally lacked the patience! Is it possible for you to share pics of your table cloths and fridge covers? Thanks Pallavi. The original idea was from pinterest, but it used single color paint. I got bored with single color, so I decided to try creating patterns with multiple shades. Wow some talent! I am so gonna read that post and try it out. @Naina - Thanks! :D Feel free to message me if you have any questions. And yeah, use the enamel paints with which we paint railings of windows and balconies. They are water-proof to an extent. This looks excellent! I am so poor at doing stuff like this! I did about 7-8 different designs in this batch. Looking for some fancy glassware now... might have to make a trip to the raddi-waala! Yeah do give it a try. It's easy but takes patience. Message me if you have any questions ok..